Melissa was the first of our high school friends to get married. I remember the day she told us she was engaged. It was such a big deal and a realization that we are truly "adulting" now! As we get older and live in different cities it becomes harder to see each other as often as we’d like. Friendships like these last forever regardless of distance and time but it was so nice to see everyone together again for such a special occasion. It was like no time had passed. 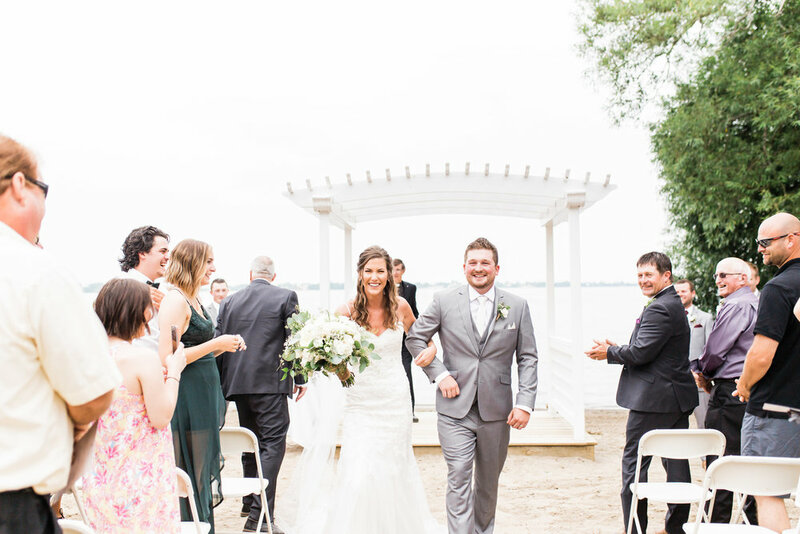 Melissa & Dillon celebrated their wedding this past July at Isaiah Tubbs Resort in Prince Edward County. The bride and groom said “I do” on the beachfront surrounded by family and friends. 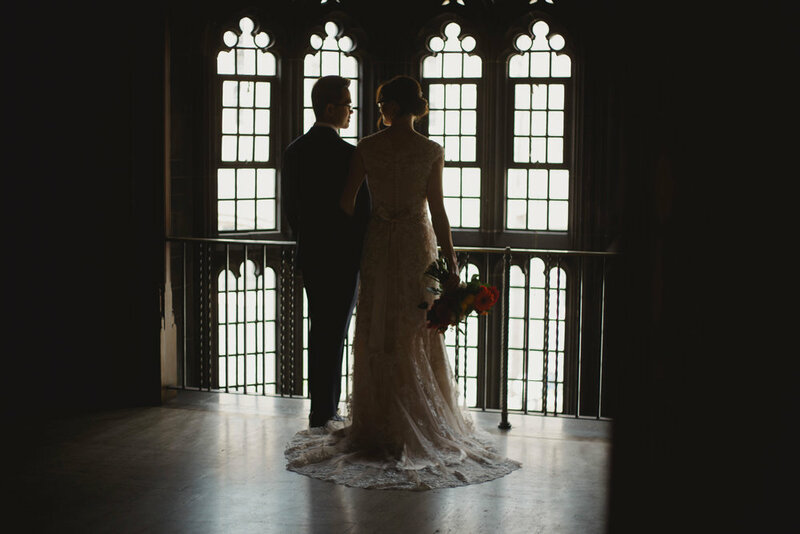 West Lake created the perfect backdrop for their first few moments as husband and wife. I will be honest, I spent most of the day crying happy tears while making sure their day was stress-free!! Melissa wore a beautiful gown embellished with lace detail while Dillon was dressed in a sharp grey suit. The wedding party was looking fab with the boys also in light grey with merlot ties matching the girls dresses! Our talented friend Lara, created the bridal party bouquets and boutonnieres to complete the look. Melissa's bouquet was lush with white roses, baby's breath and greenery wrapped in burlap. She looked absolutely stunning! Following the ceremony, bridal party photos began while guests walked to the outdoor reception lit by Edison lights and tealight candles. Melissa worked on several DIY projects over the summer, creating a romantic atmosphere that represented their relationship perfectly. To name a few, she designed all of her wedding signage and made each centrepiece crate by hand with wooden paint sticks. It looked amazing! They also strung photos from over the years in old wooden frames. You couldn’t help but smile looking at their old photos from first year at Brock U. As you looked around the reception, the room was filled with endless smiles and laughter. The love surrounding both Melissa and Dillon was evident. The speeches had you tearing up and laughing until it hurt. You didn't want the stories to end! This wedding was not only full of emotion and love but also great humour and you bet they knew how to PARTY. The dance floor was packed thanks to country classics bringing out the best moves from all ages. Melissa and Dillon were tearing up the dance floor ALL. NIGHT. LONG. If you couldn't keep up on the dance floor you could hang out by the fire and make some delicious SMORES! 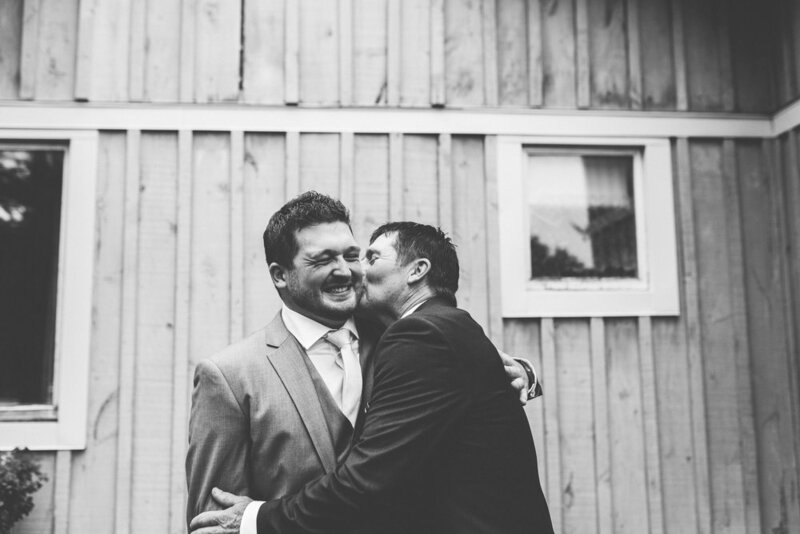 It was the perfect summer wedding in Prince Edward County. Melissa & Dillon, I wish you a lifetime of love and happiness! Cheers to celebrating many more milestones together! Our cousin gave birth to two beautiful twin girls earlier this year. 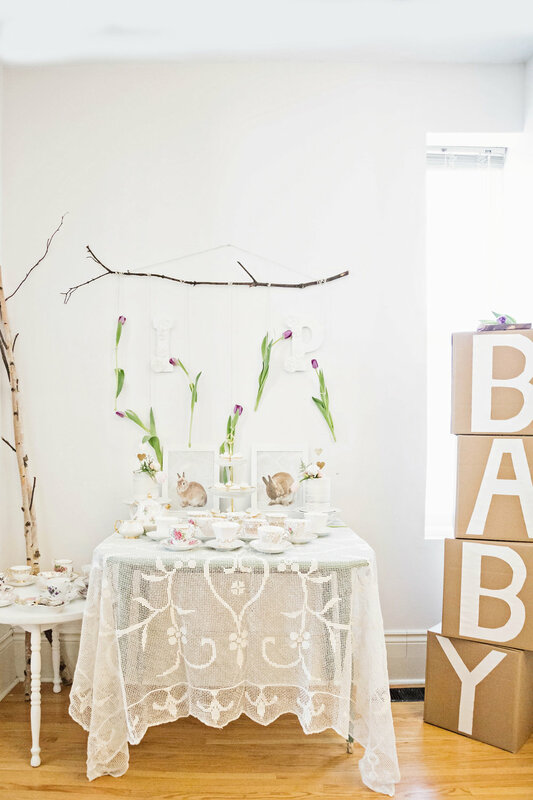 Ecstatic to meet the little bundles of joy, we wanted to throw our cousin a relaxing tea party in an intimate setting for family and close friends. With spring just around the corner we were set on a "spring" themed celebration. We used a soft palette with blushes, whites and hints of greenery. 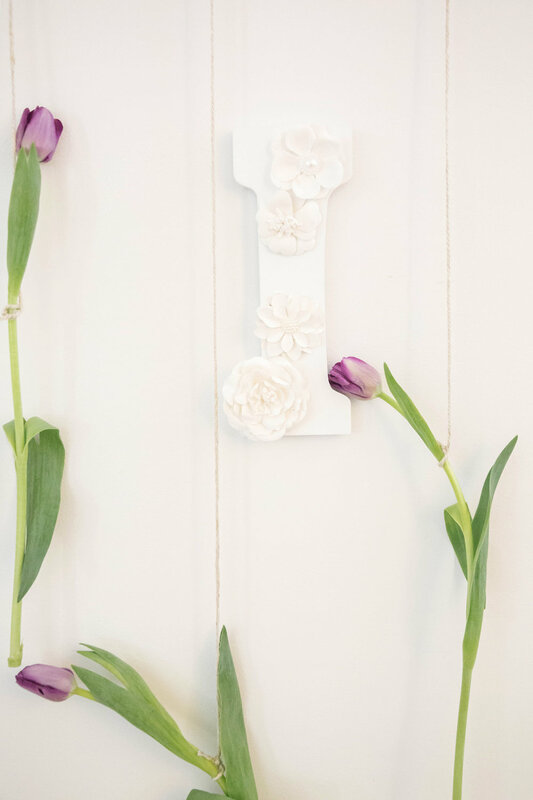 We incorporated tulips, spray roses and shots from Gooseberry Studios bringing the "spring theme" full circle. Bunnies with floral crowns!? Does it get any cuter? The sun poured into the house creating a whimsical atmosphere as family and friends sipped tea from vintage teacups while meeting the newest additions of our ever growing family. It is not everyday we get to organize celebrations for family so this was extra special! Not pictured: The twins adorable matching outfits and their mama's DIY floral crown. A big thank you to Laura from Gooseberry Studios for capturing the set up perfectly!!! Cake / Cupcakes: Enticing Cakes Inc.
We were ecstatic about Tanya and Michael’s wedding plans just minutes into the initial meeting. It was truly their dream wedding! We feel so lucky to work with couples like Tanya and Michael in this industry. You couldn’t find more genuine people! 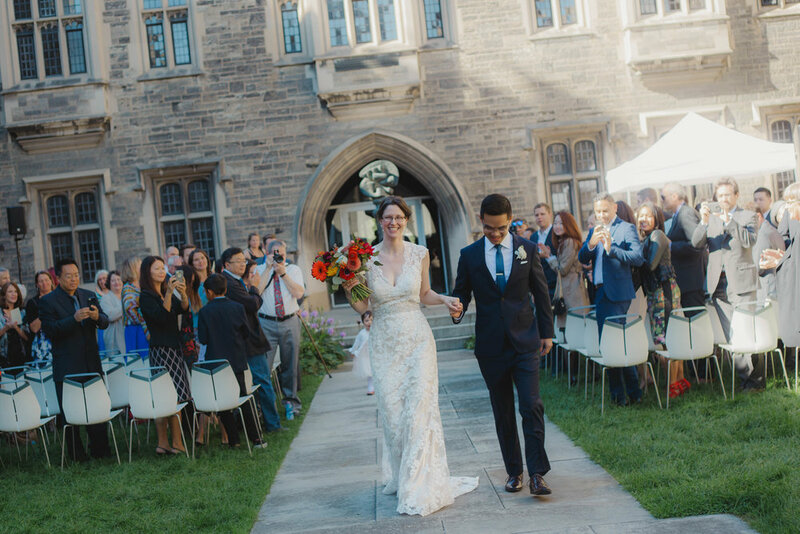 We arrived at U of T’s Hart House early Saturday morning for the beautiful September wedding. The sun was shining, the birds were chirping - it was a perfect day! The ceremony was set up in the breathtaking courtyard. If you have not visited this venue before - it is a must see. 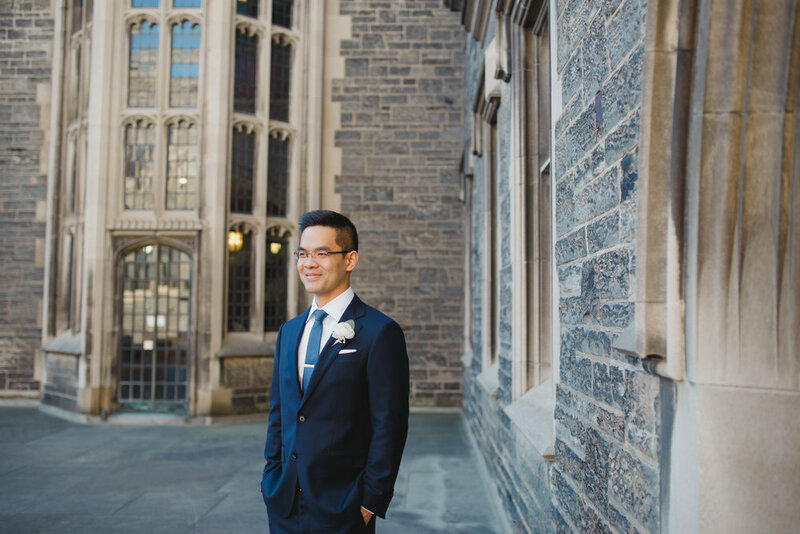 Tanya and Michael met at U of T years ago making this ceremony location even more special. 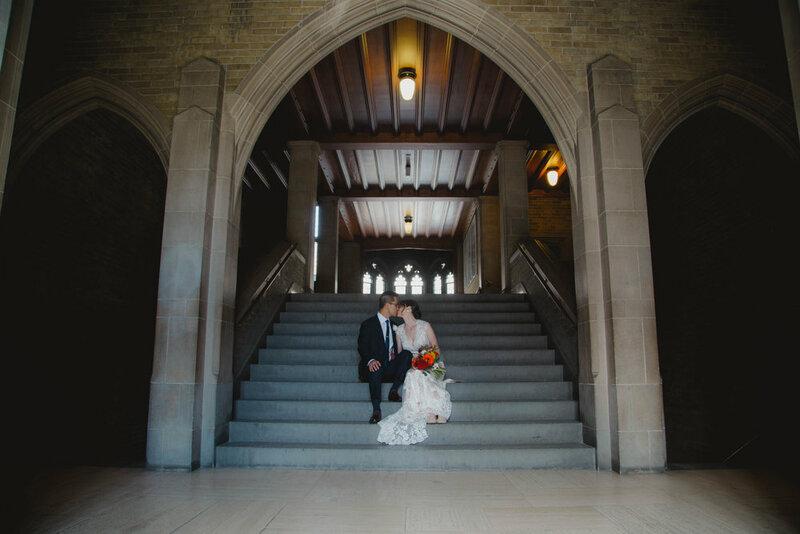 The ceremony setup was simple and elegant surrounded by the beautiful architecture of the old building. 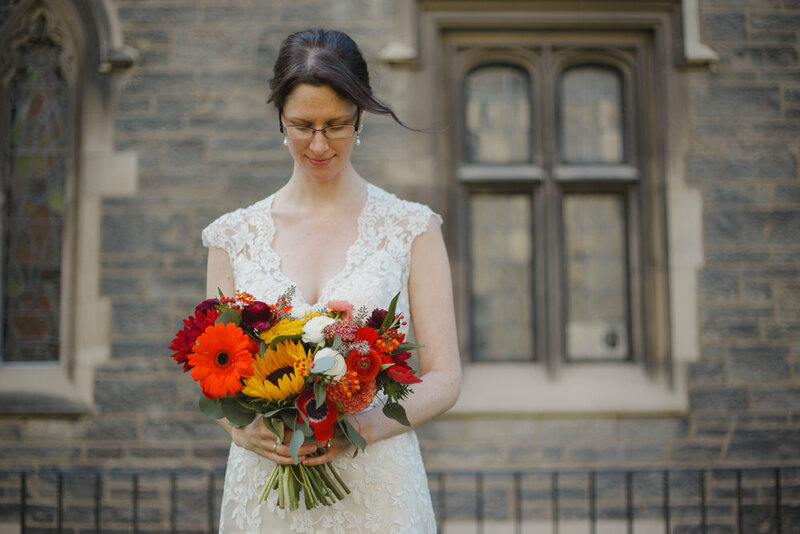 Tanya walked down the aisle in a lace wedding gown with a stunning bouquet designed by Botany Studio. 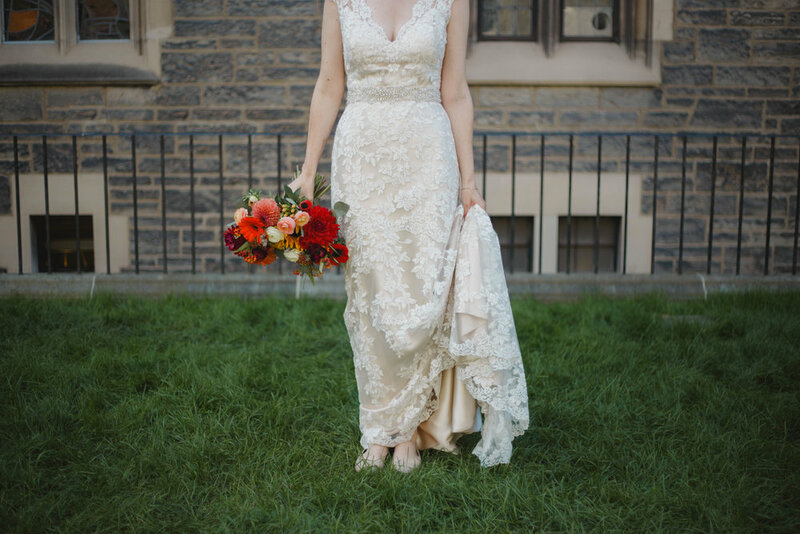 We loved the pops of reds and orange incorporating Fall feels into this September wedding. After the ceremony the bride and groom snuck away for romantic photos while cocktail hour began at the one and only Canoe towering 54 floors above the downtown core. As guests arrived from Hart House they enjoyed passed hors d'oeuvres, wine and live entertainment by GTA Strings. Amazing cuisine with a beautiful view of the city was an important aspect of their wedding day. It is no surprise Canoe was their number one choice. Each table setting combined white linens and flowers with pops of colour similar to Tanya’s bouquet. 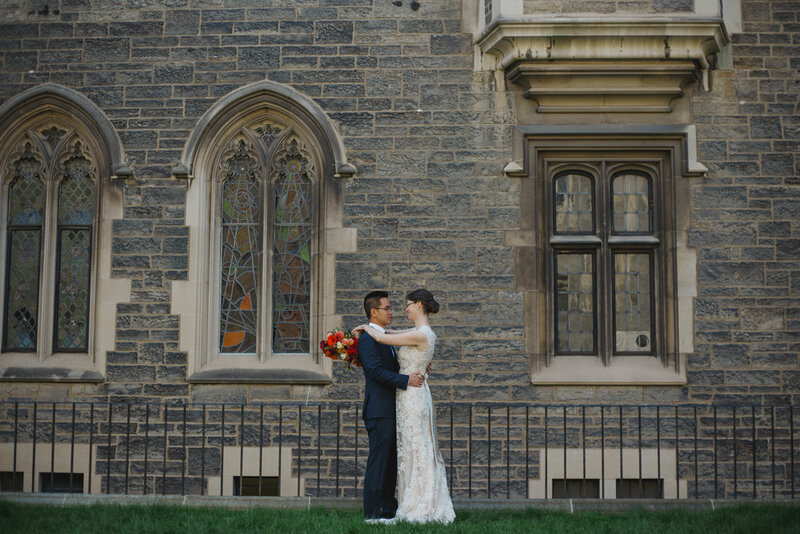 As a Oliver and Bonacini venue the bride and groom, guests and vendors were treated like royalty. It was exactly what they wanted - a divine menu with a view, surrounded by their loved ones. 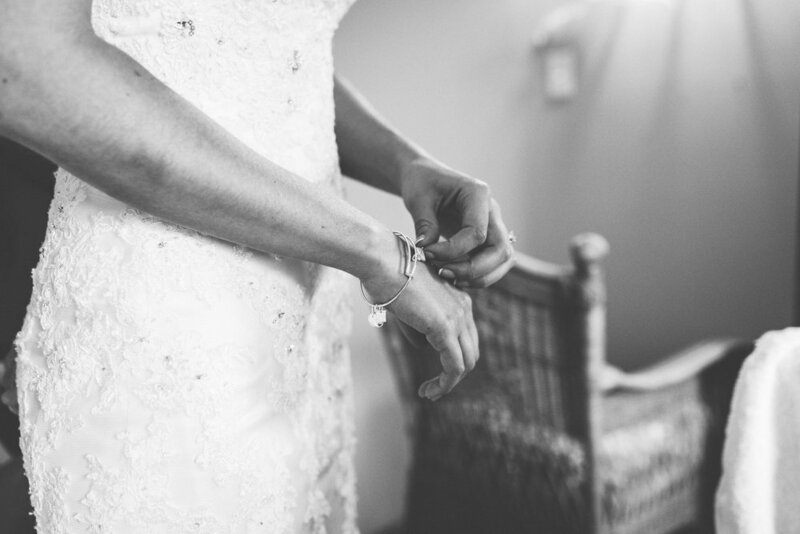 It is hard to find the words to describe the beauty of Reghan & Trevor’s wedding day this past Summer. We absolutely loved the personal touches the bride and groom incorporated into their day creating the perfect backyard wedding. It warmed our hearts to see this couple surrounded by so much love from many family members and friends. After recently moving back to Ontario from British Columbia, this couple brought their love for the West back with them. 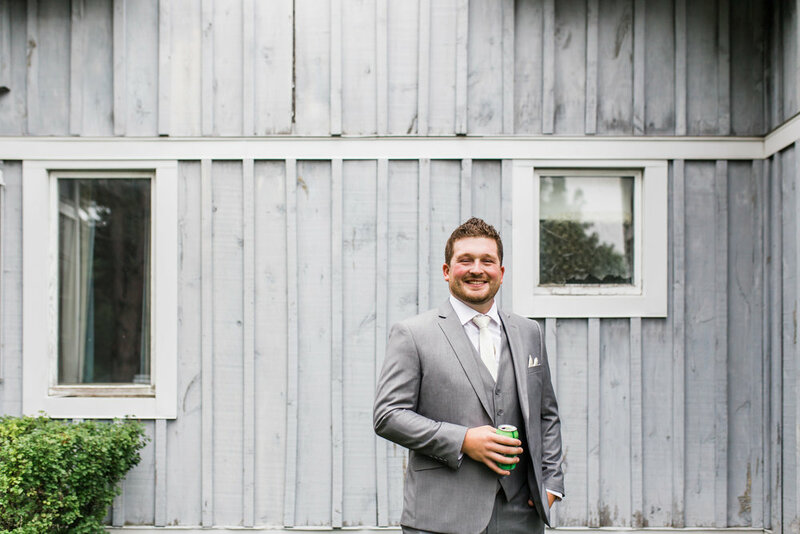 A wedding on the family property was the perfect way to start their new chapter back in Ontario surrounded by their loved ones. Several of the wedding guests travelled from the rockies and even as far as Australia to see the bride and groom say “I do”. The Ceremony took place in front of a giant oak tree marked with two pillars. Bunches of flowers designed by the bride’s Aunt hung from every other row of white chairs. The ceremony was simple yet elegant. The beautiful bride made her ceremony entrance, pausing at the top of the family home stairs before walking down the aisle to exchange vows with her future husband. A heartfelt ceremony was followed by cocktail hour in the front yard with lawn games, hors d'oeuvres and a signature Bellini. The wedding reception tent reached high into the sky with beautiful vintage style globe lights and greenery creating the ultimate romantic atmosphere. 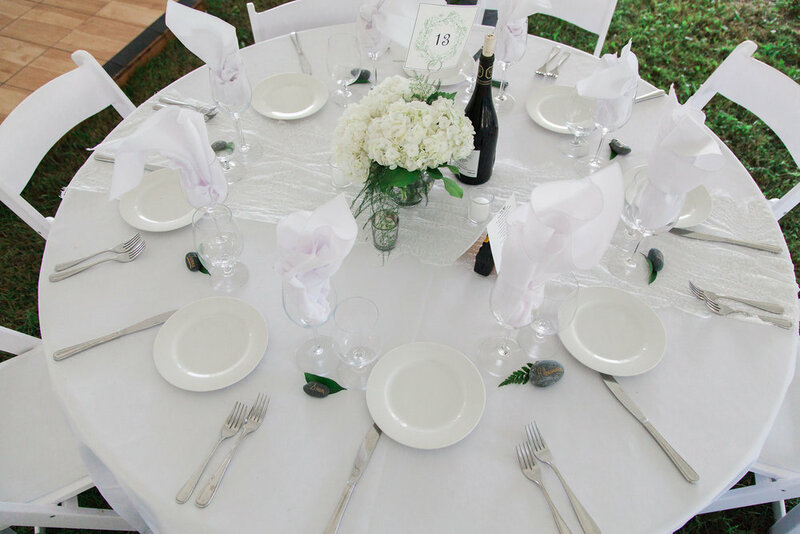 Each table setting included a personalized stone set on greenery. Tea lit candles and white hydrangeas completed the table setting with white lace runners. As the sun set over their family property the wedding became even more whimsical with vintage style globe lights strung outside the tent and mason jar candles lit throughout the yard. The speeches didn’t leave a dry eye in the tent while the bridesmaids also surprised Reghan and Trevor with an amazing wedding video causing many laughs! After a delicious meal by King’s Plate, Reghan and Trevor danced to Ed Sheeran’s “Tenerife’s Sea” as husband and wife! Reghan and Trevor, thank you for trusting us to be a part of your special day! This is a wedding we will never forget! 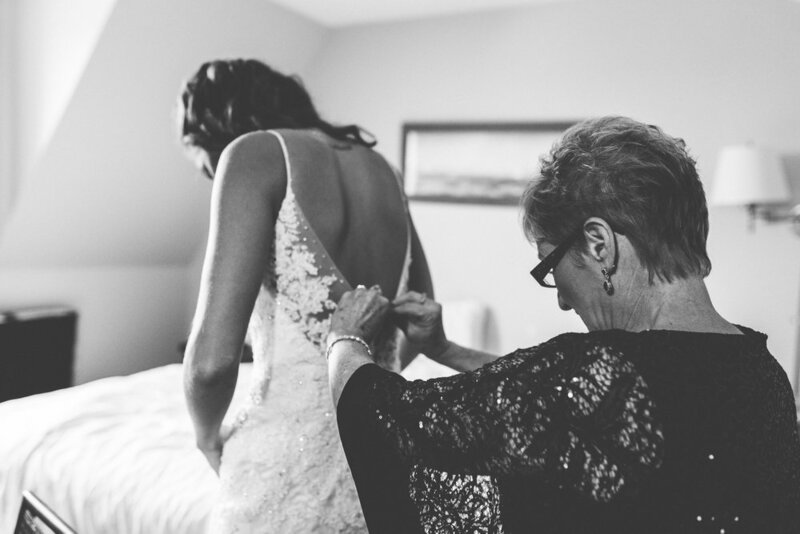 Brooke & Matt’s wedding took place on a beautiful Saturday this past July in Cobourg, ON. Both the bride and groom grew up in the “feel good town”, making it the perfect place to bring their family and friends together to celebrate their love. Brooke & Matt’s ceremony was on the 8th hole at Cobourg Creek Golf Course, with cocktail hour to follow at The Mill Restaurant & Pub. 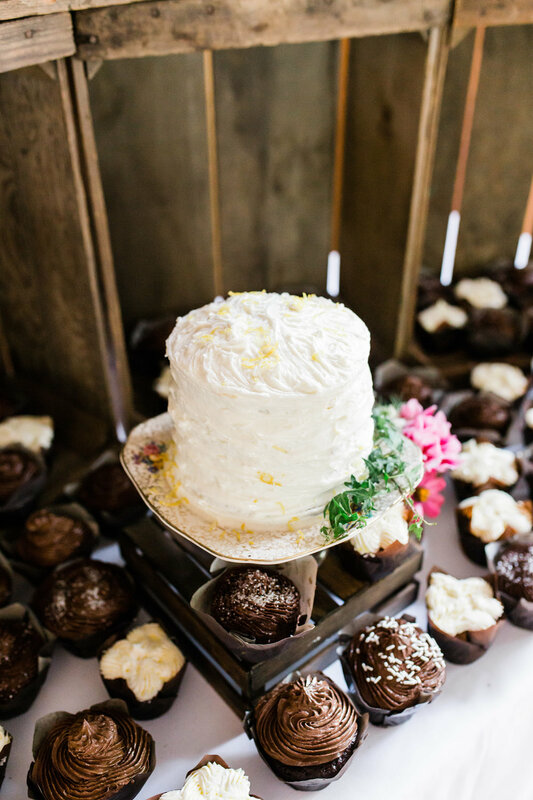 The bride and groom provided lemonade on the hot summer day while guests waited for the ceremony to officially begin. The golf course was a great spot for these love birds to say “I do” as Matt is a true golf enthusiast. Brooke and her father made a grand entrance to the ceremony in his classic oldsmobile , where Matt waited for the beautiful bride in a traditional kilt, with colours dating back to his family roots. Brooke & Matt walked down the aisle as one while bagpipes played in the background. Their golden retriever puppy, Aspen even got to visit during cocktail hour for some cute shots with Mom and Dad. We loved all the personal details! 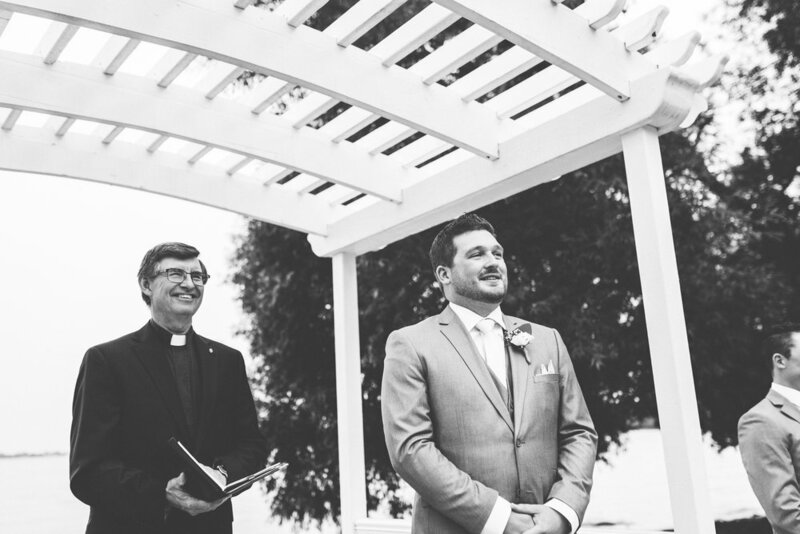 You couldn’t have asked for better weather for this timeless outdoor ceremony. The wedding reception took place at The Cobourg Best Western down the street from the Cobourg Creek Golf Course. 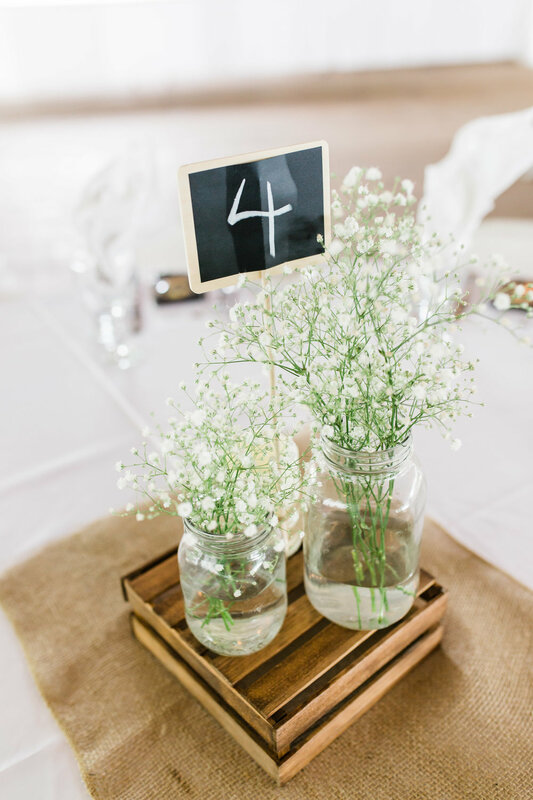 As soon as you walked in the reception doors you were taken away by the romantic atmosphere created by Garden Girl Décor and DIY projects by the bride and groom’s families. The party was instantly started with memorable entrances by the bridal party and bride and groom! The night continued with great stories and memorable moments - we don't think we have ever laughed and so many cried happy tears! It was a wedding perfect night in the "feel good town" of Cobourg.